Professor Gunji will give a brief history of Japanese flower arranging (Ikebana) and will explain the characteristics and functions of tea flowers (chabana). She will also demonstrate various styles of ikebana arrangements featuring chabana. Kimiko Gunji is Professor Emeritus of Japanese Arts & Culture in the School of Art & Design, University of Illinois at Urbana-Champaign. She is a Full Professor at the Ikenobo Ikebana School (Japanese flower arranging) in Japan and Chapter President of the Illinois Prairie Ikenobo Ikebana. 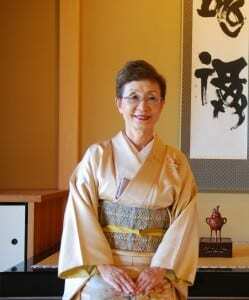 She holds the tea name, or Chamei, Souki from the Urasenke Tea School and serves as President of the Urbana-Champaign Association of Chado Urasenke Tankokai, Inc. as well as a teaching certificate of Japanese Classical design. Kimiko has received numerous awards for her teachings as well as for her contributions to promote Japanese arts and culture. Among them were the University of Illinois Campus Award of Excellence in Undergraduate Teaching, the Illinois Arts Council Fellowship in the Field of Ethnic and Folk Arts, and the Commendation from the Foreign Ministry in Japan for her contribution to promote and strengthen the ties of friendship and goodwill between the United States and Japan.